Hector's and Maui dolphins are the smallest and rarest marine dolphins on earth and live only in New Zealand. Gillnetting and trawling have decimated these diminutive dolphins to near extinction and continue to kill them faster than they can breed. Hector's dolphin numbers have dropped from 29,000 to around 7,000 since the 1970s. The situation for Maui dolphins, a subspecies of Hector's dolphins, is even worse. With just 50 survivors, Maui dolphins are facing imminent extinction. Despite these low numbers, the New Zealand government is refusing to protect the country's only native dolphins against fishing nets. Less than 20 percent of the dolphins' home is protected against set nets and around five percent against trawling, which simply isn't good enough to prevent their extinction. Experts have called for a ban of these fishing measures across the dolphins' habitat for more than three decades. But the New Zealand government isn't listening and the fishing industry denies all responsibility. Each year there are fewer dolphins left. How many more have to die before the New Zealand government acts and protects their entire habitat from harmful nets? International pressure is crucial to saving Maui dolphins and your support will show that the world cares about New Zealand's forgotten dolphins. Please join the call for a full and immediate ban of gillnetting and trawling throughout Maui and Hector's dolphin habitat in coastal waters up to a depth of 100 meters, including harbours. JUST 1 WEEK LEFT TO OUR PETITION HANDOVER - 150,666 signatures and counting!!! The life of the last 50 Maui dolphins hangs by a thread. More than 98% have already been wiped out primarily by fishing nets. We will be handing over our petition, which calls for the immediate removal of harmful fishing nets to avert the extinction of these small marine mammals, to former New Zealand Prime Minister Helen Clark in Berlin, Germany. HELP SAVE WORLD'S RAREST DOLPHIN! There are less than 50 Maui's dolphins left. All live in New Zealand. Fishing is their biggest threat and extinction looms. Thank you for being one of 144,500 people who’ve already taken a stand. 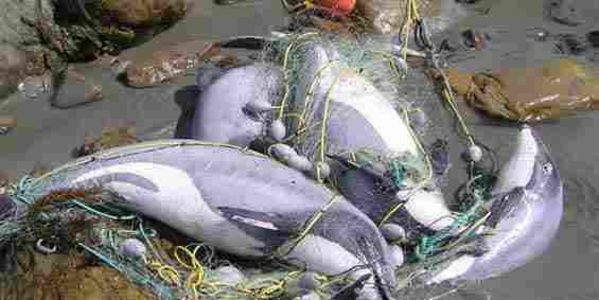 Scientists found that 4-5 Maui's dolphins die in fishing nets each year. But the industry is unrepentant..
Let's remember Maui's & Hector's dolphins this Earth Day. Your voice is important. It's the only one they have.